UNCW Cameron School of Business' Center for Sales Excellence and Customer Delight was launched in March of 2018. The Center was created with the mission of developing students' ability to think and work collaboratively by teaching, coaching and pushing students to operate with a win-win mentality. By offering a variety of events hosted by faculty, the business community, and sales professionals, this Center offers Cameron School of Business students a competitive advantage in acquiring jobs and internships. 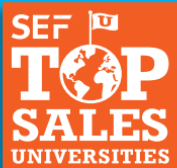 The Center for Sales Excellence and Customer Delight is an Associate Member of the University Sales Center Alliance. Give to the CSB Marketing Dept. Be sure to search for 'Marketing' to direct your gift to the CSB Marketing Department!